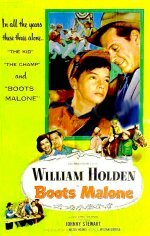 It's a sentimental tale, set at a racing stables where Johnny Stewart is a rich kid who loves horses. Holden is a jockey's agent who hasn't won a race in years but who thinks "The Kid" might change his luck. Veteran director William Dieterle had the chore of calling the shots, and he relies heavily on Holden's innate charm.